While living in New Port Ritchey, Florida in 2004 I stumbled upon Bene's International School of Massage not far from my house. Having a bit of basic knowledge as to what therapeutic massage was, I decided to go in and look into what the program offered. Needless to say 10 minutes later I was signing a $10,000 contract and decided then and there that I was going to become a Massage Therapist. From the beginning it just felt right. Here we are 13 years later and honestly I still love the work that I do. After graduating from Bene's International School of Massage in 2004, I went on to become Nationally Certified as a Licensed Massage Therapist by the NCBTMB National Certification Board of Therapeutic Massage and Bodywork. I currently hold a Massachusetts Therapeutic Massage License and have been actively practicing Massage Therapy professionally since 2005. In early 2013 I found myself wanting to do more. This time I found Elizabeth Grady school of Aesthetics in Medford, MA. Again it only took a short 10 minutes to realize that this too was what I wanted to do. By October of 2013 I had graduated and become a Massachusetts Licensed Aesthetician. It was just a good fit for me. Blue Stone Massage and Skin Care at 228 Central St. Saugus, MA 01906. I have found that I am happiest when I am helping others to feel good about themselves. I know my limits and realize that though I will never heal anyone, at the very least I can honestly make them feel better simply with the touch of my caring hands. Thanks for taking the time to read about me. When planning the studio, the vision was to create an environment that offered a comforting massage experience utilizing brand new massage equipment and combining it with a soothing environment. Hoping to appeal to all five of your senses. I focused on calming décor and a relaxing color palette for the eyes. A clean air environment left pure or scented to your personal preference. Refreshing drinking water for hydration and a small treat to take with you. Relaxing music to fill the room for you to enjoy during your massage. The last and most import sense is the sense of touch. This is my specialty. Delivered in many forms and modalities to treat specific ailments or simply rid you of stress, I aim to provide you with the treatment best suited for your individual needs. I welcome you to come in for a visit with me. The electric lift massage table can be lowered to accommodate those with injuries or mobility issues allowing everyone a setting to relax comfortably and receive a massage that will leave you feeling amazing, refreshed, and lifted of spirit! 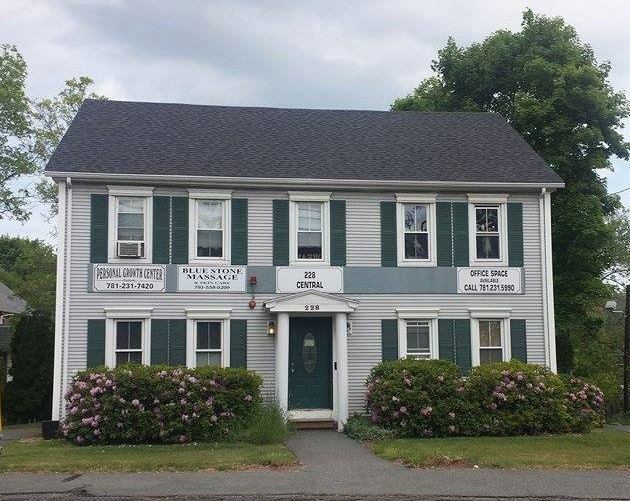 Blue Stone Massage and Skin Care is a small massage studio located in Saugus, MA. It sits along the Saugus River next to the Historic Saugus Iron Works. When looking for a location for the business I wanted to find a little spot that was tucked away from the hustle and bustle of the highway and the busyness of everyday life. Massage is meant to be relaxing as well as uplifting. Having worked in fast paced massage franchises for far too long, I wanted to slow down the pace and concentrate on the most important person in the room "the Client." Here at Blue Stone a 1 hour massage is just that 60 minutes of you receiving a hands on massage. Of course I do ask that you respect the standard arrive on time policy but again it is only so that you can enjoy your entire visit with me. Out of respect for the next client I do keep to my schedule factoring in check-in and check-out time that is not included in the massage appointment time. Call (781) 558-9299 to book your appointment now or please feel free to schedule your appointment with me online.